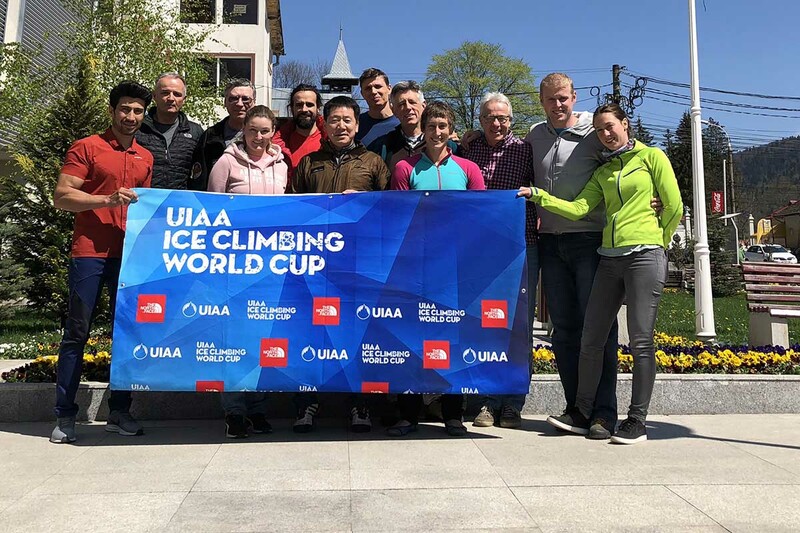 The UIAA has organised the sport of ice climbing for the past 15 years and in that time has witnessed the incredible growth in popularity of the sport throughout the world. Ice climbing is a dynamic sport, combining determination, technique, speed, precision and excitement. The sport is increasingly appealing to young people, evident by the number of international climbers who take part in our World Youth Championships. The sport combines the allure of the winter sport environment with fast-paced action, intelligence and determination. In the lead discipline, ice climbers require great technique, tactical mastery and nerves of steel in executing complex moves in seemingly improbable positions. The speed discipline is almost a vertical take on the 100m sprint in the sport of athletics. It’s about raw power, core strength and aggression. The history of the UIAA Ice Climbing’s involvement in ice climbing dates back to 2002 when the first World Cup competitions under UIAA rules took place in Val Daone (Italy), Pitztal (Austria), Kirov (Russia), Quebec (Canada) and Saas Fee (Switzerland). The International World Cup (IWC) was preceded by a European competition schedule which included events in Courchevel (France), Cortina (Italy), Pitztal (Austria) and Kirov (Russia). The first common rules to govern competitive ice climbing appeared in 1998 and the first International World Cup took place in 2000, organised by a private German company, which remained responsible for the event until 2002 when the International Ice climbing Commission of the UIAA took over. The history of the sport, however, dates back to 1912 when the first known ice climbing competition was organised on the Brenva glacier in Courmayeur, Italy. Ice climbing lead-difficulty discipline takes its roots from alpinism. In the 1990s, competitive ice climbers were alpinists who decided to challenge each other on a specially-prepared ice structure. Participants in competition used the same equipment as they were using for mountaineering. Over the years, competitive ice climbing branched out from mountaineering into a separate discipline of its own. 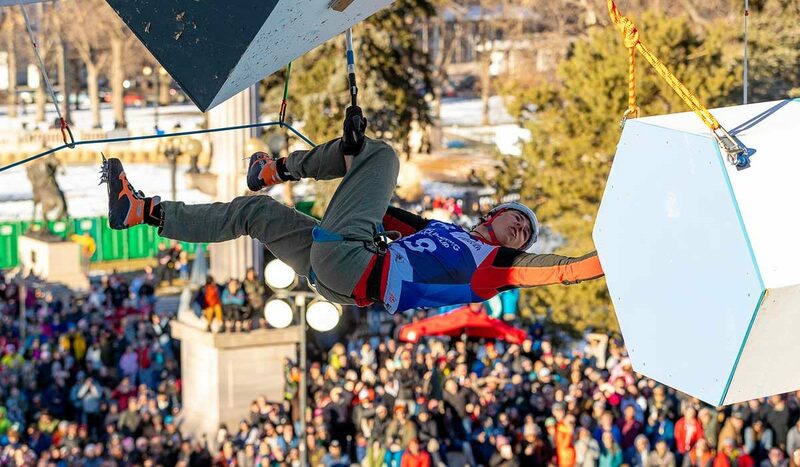 Nowadays, ice climbers are professional athletes who train especially for ice climbing competitions, and the competition events take place around the world. 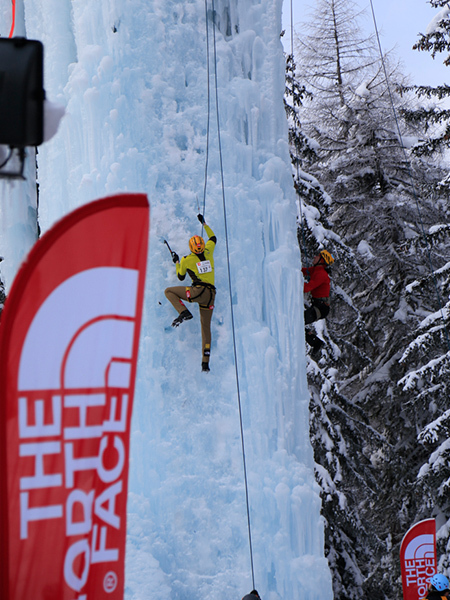 Equipment manufacturers produce equipment specifically designed for the use of ice climbing competition. 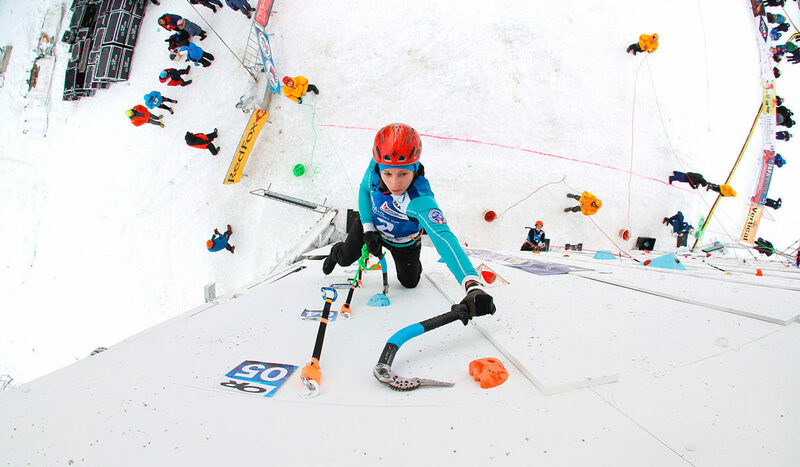 Lead-difficulty competitions organized by the UIAA generally take place on artificial ice climbing structures. The purpose for this is to standardize the competition routes among all athletes. Usually, there are three rounds in a competition: qualifications, semi-finals, and finals. In each round, the competitor who is belayed from below must climb in lead-format, a route where quickdraws are clipped sequentially. For security, one or two of the first quickdraws are pre-clipped by the route setters for each athlete. 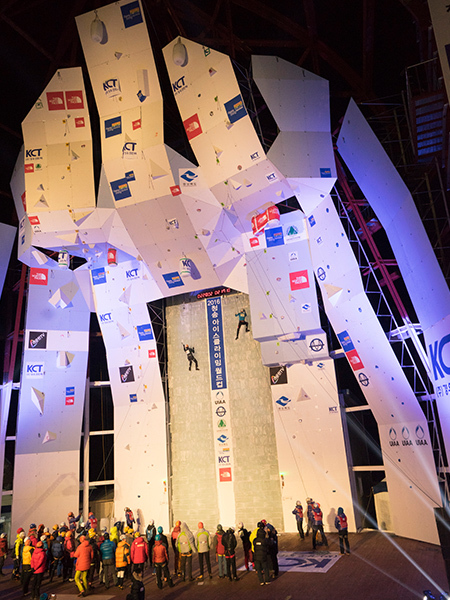 Each participant is allowed a single attempt to climb the route in all rounds except the qualification round. In qualification rounds, the athlete is allowed to start a second attempt if in the first attempt she couldn’t clip first quickdraw after the pre-clipped one(s). In addition, each climber has a predetermined time to climb the lead-difficulty route in every round. Time starts when an athlete leaves the starting position, and stops when an athlete falls or finishes her performance on a route. Athletes must terminate their attempt on the route when the allotted time is expired. The result of each athlete is mainly based on the height achieved by the climber. Time is also considered by the referee when an athlete finishes an attempt before the route time is over. While Italy and France were the first countries to organize lead difficulty competition in ice climbing, Russia (the former Soviet Union) was the motherland for speed competition. Probably the early pioneers of this sport were alpinists from Russia, negotiating fast ascents of various mountain routes. In the early 1960s in Russia, speed competition in rock climbing and alpinism were extremely popular among mountaineers and rock climbers. By the late 1980s speed ice climbing competitions were formalized and regularly organized in the country and come the late 1990s other speed ice climbing events started to emerge in North America and Europe. Today, speed competition is considering a technical discipline, practiced on an ice wall. Speed competitions are organized at every world cup stage. 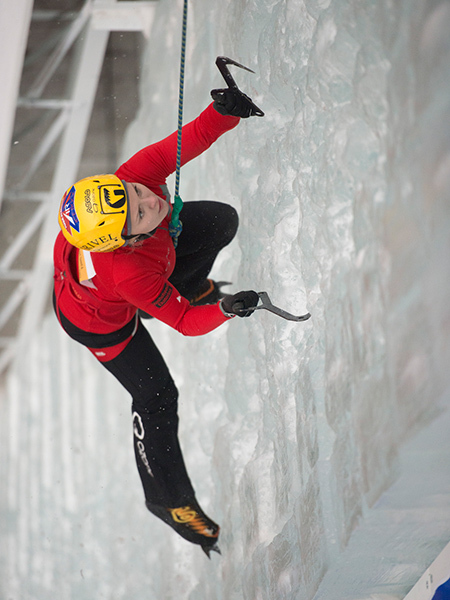 Modern speed competitions are held on a vertical ice wall from 12 to 15m high. The format could be either on a single route or in duel. To maximize competitor and audience interest, the UIAA recommends the duel format. In these cases, two walls are constructed, one next to another. The format is simple, the fastest climber wins. Compared to lead-difficulty competition, the speed competition is less well known. 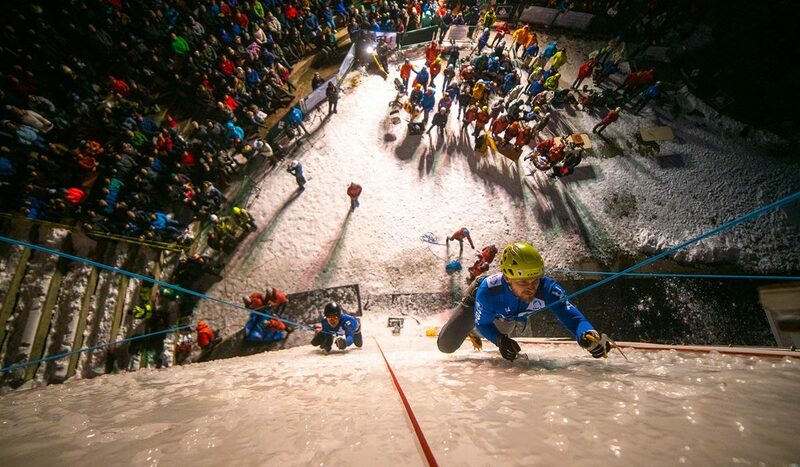 However, this sport is worth the recognition of the ice climbing community. In recent years, speed climbing has been shown to catch the spectator’s eye, and is more easily understood by the masses. Fast but serious, are good words to qualify this discipline. For those wishing to get involved in the sport of ice climbing whether as an athlete, coach or organiser, the UIAA has harnessed the knowledge it has built up as organiser of the sport by producing a dedicated Practice ICE Climbing handbook. This manual, written by UIAA experts, is a key document gathering a wide range of information on several topics: including speed climbing, lead-difficulty, national teams and event management. It is dedicated to member federations, athletes, national bodies, event organizers and also ice climbing lovers who want to improve their skills and knowledge. The UIAA Ice Climbing Commission is responsible for framing the rules and regulations for ice climbing competitions. It also ensures quality of the competitions as per UIAA terms and standards. The Commission is also responsible for the administration and development aspects of ice climbing as a sport. 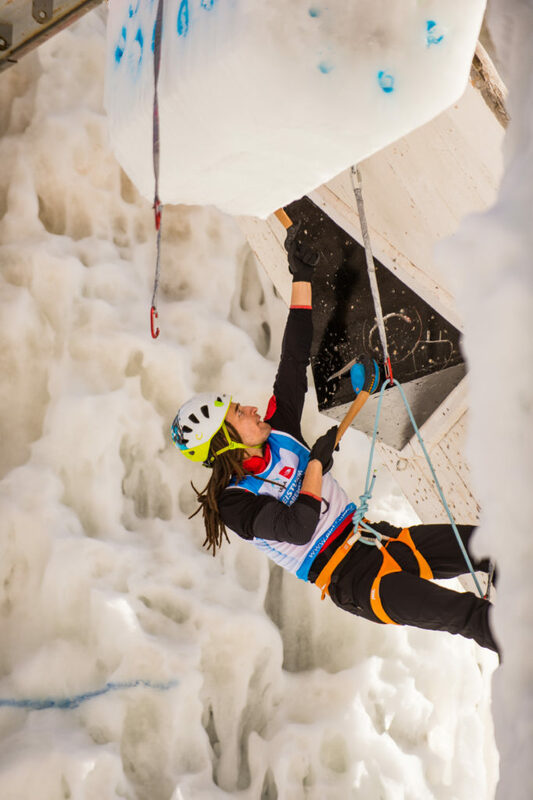 It has helped organize the UIAA Ice Climbing World Cup competitions since 2004. The Commission has also been involved in making rules for these competitions simpler and fairer to encourage greater participation in the sport. As part of its development activities the Commission organizes courses for route setters and judges. These technical courses help the aspirant judges and route setters learn more about the latest rules and innovations in the sport. 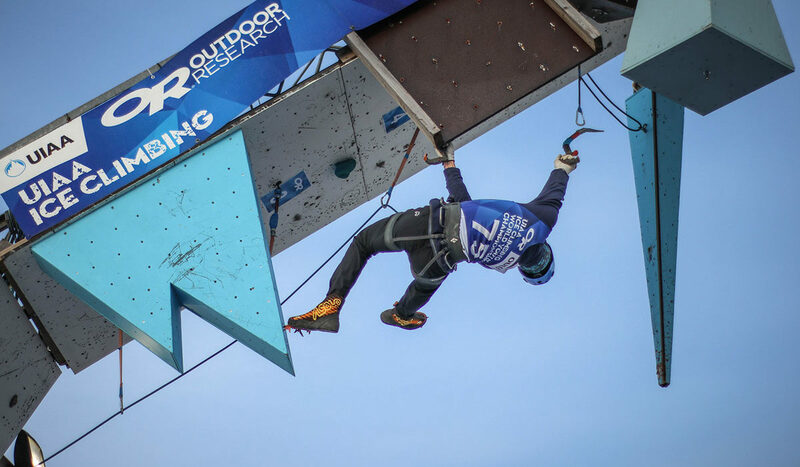 Outdoor Research is Title Sponsor of the UIAA Ice Climbing World Tour. The UIAA is a member of GAISF, an association composed of autonomous and independent International Sports Federations and other international sport and event related organizations.